This little book on music came out in 1997. It has been one of those controversial books that criticizes contemporary music on the basis of style. 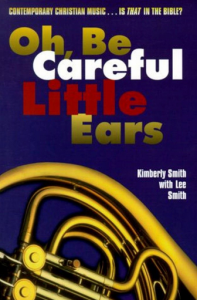 Smith’s educational background makes her qualified to do this, however, it is a difficult way for the rest of us laymen in music education to follow. I have read as many books like this that I could, and I don’t necessarily disagree with them, but I have a hard time picturing offbeat accents, unnatural and natural rhythms, dissonances, and “rhythm that conflicts with the melody.” I am sure that much of this type of music exegesis has validity. I also know that it has gathered more than its share of criticism from progressive musicians. I say I don’t disagree because when I hear “rock” music and its kind, especially in Christian worship, I don’t like it either, but not for the same reasons. My criticisms come more from a cultural point of view. To say it is worldly is enough for me. But the purists are needed in any field.